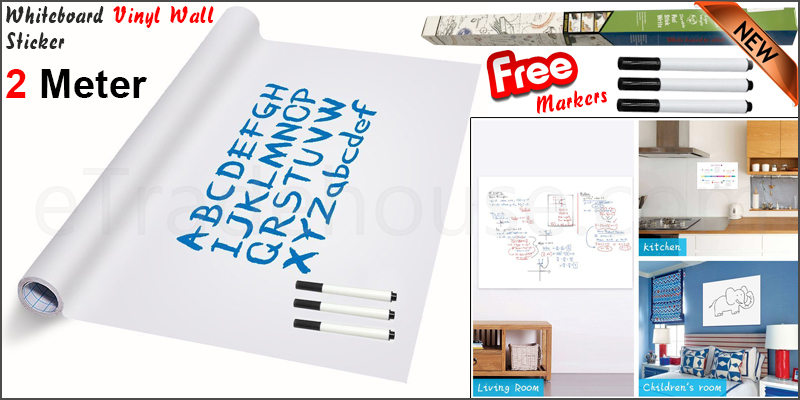 This Self Adhesive Whiteboard Sticker Roll is 2 meters Long and 60cm Wide. Allows you to create a Whiteboard from a Roll, anywhere in seconds. Multiple Uses can also be used as a Projector Screen. Perfect for use on any smooth, plain and flat surface including plastered wall, painted walls, windows, mirrors, counter tops and wooden doors. Perfect for office meetings, training sessions, conferences,at home, at school, conferences, workshops and brainstorming. Easy to Use: Simply peel the whiteboard decal off its backing and smooth onto any clean flat surface, such as doors, walls. It is also easy to remove without any damage the surface. Wipe clean with a damp cloth. Exert your imagination and cut it into funky shapes. DIY Simply cut to length or shape for a custom application. Decorate your living room or bedroom with a new favourite quote. Add a personalised edge to your party table decor. With a little creativity, use this chalkboard sticker to express your endless creativity.